Whenever we have an open house or have people visiting our office the first thing they notice is the historic space we occupy with its high ceilings, detailed trim and balcony and other fine details. Being able to work in such a charming environment with lots of natural light allows our working space to be just as creative as the products we get to make. 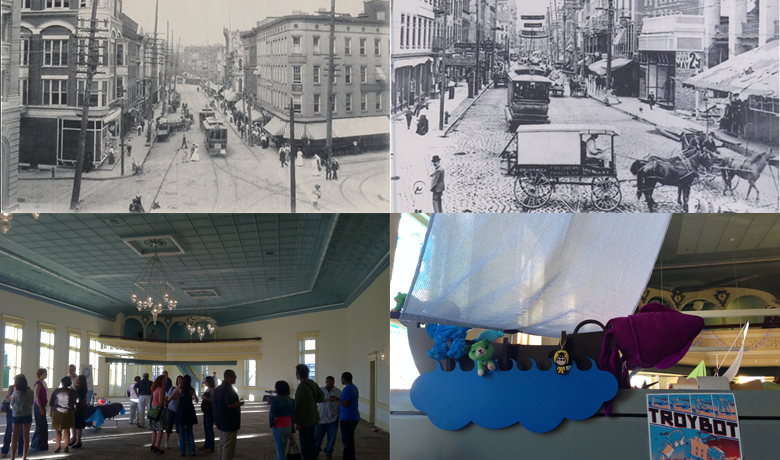 We enjoy being a part of this buildings' history and enjoy sharing its roots with all who visit. Harmony Hall was build in the 19th century when Troy was a prosperous city, being a hub of the American Industrial Revolution, known for manufacturing cuffs, collars and having a large ironworks. Harmony Hall was a prominent building of the Market Block, which featured many shops on the ground floor. The Hall on the third floor which our office now occupies has been home to many elegant balls and important meetings. According to Don Ritter's Troy: A Collar City History "In late September 1836, ... the bones of a prehistoric mastodont were found embedded in peat in two potholes. These fossils were put on display in Harmony Hall at the corner of River and Third Streets for a duration before they were donated to the New York State." We moved into Harmony Hall in 2011 after heavy renovations as it, much like many of the historic spaces around Troy, had fallen into disuse. Working with our landlord and some local groups we were able to restore the space into a modern environment that maintains the historic charm of the original building. On April 1st of 2011 we hosted an open house at Harmony Hall to celebrate our anniversary and so people could view the space before we moved in. The pictures above and below are from directly before the renovation and then from our open house.